The NFL season begins in just more than two weeks, which is later than usual and still sooner than one realizes. We thought we'd take a look at each NFL division over the next fortnight, a scattershot glimpse that will be more updated than the magazine you grabbed before your flight but far less informative and helpful. 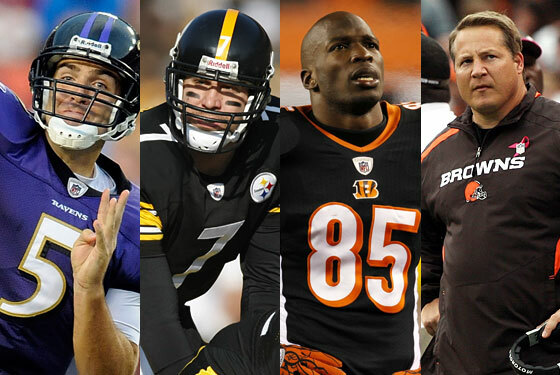 First up: the AFC North! Most important player: Joe Flacco. Person to root against: Donte' Stallworth. Fictional organizational factoid The team's first head coach was poet Edgar Allan Poe, but he had to leave the team because of his debilitating syphilis. Games against NY teams: Week 1, Monday, September 13, at Jets. Most important player: Ben Roethlisberger. Person to root against: Ben Roethlisberger. Pointless organizational factoid: To buy a Personal Seat License at Heinz Field, you are legally required to be at least 18 percent insane and/or have a history of multiple felonies. Games against NY teams: Week 15, Sunday, December 19, vs. Jets. Most important player: Cedric Benson. Person to root against: Tank Johnson. Fictional organizational factoid: The Ickey Shuffle is banned in six states, including Idaho. Games against NY teams: Week 12, Thursday, November 25 (Thanksgiving), at Jets. Most important player: Josh Cribbs. Person to root against: Eric Mangini. Fictional organizational factoid: The actual color of the Browns' helmet is blue; the perception of brown is an optical illusion because Cleveland sits in a crater created by an iceberg that melted 45 million years ago. Games against NY teams: Week 10, Sunday, November 14, vs. Jets.